This will be the first tutorial where I have done Live Streaming for you guys. Let’s move forward! This class will be responsible for storing data about enemies in the pattern. It will activate / deactivate all enemies inside the pattern. The goal here is to not Spawn / Destroy enemies during gameplay. USEFUL TIP: Spawning actors which have animations / complicated materials cost a lot of resources and can cause glitches. It’s always better to spawn them on level start (while in loading) and manage them without need to destroy / spawn again the same enemies. It will be responsible for choosing which pattern should be presented to player. Manager will choose the best pattern at given time and move it from pool to player viewport. This is really simple approach which will add a lot of freedom to designing patterns. It’s not the first time when I need to update earlier created functionalities. In games you will be always getting back to things you have created earlier. Currently my enemies are Destroyed on Die. I need to have a way to communicate to enemy and tell him to activate / deactivate. In this Tutorial I will update Drone Enemy as it have physics. It will be used to communicate with Enemy from Pattern class. It should be self explanatory. 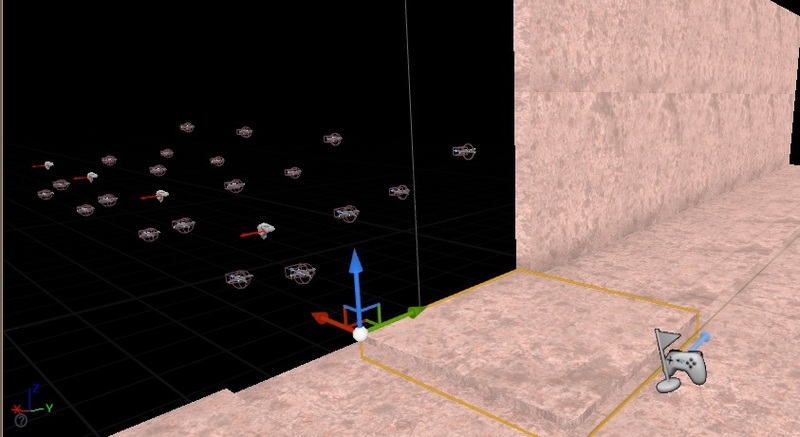 Those variables will store translation of each drone part before running physics. So we can use them later to restart the location and rotation of the parts. Add another function named SetPartsLocationBeforePhysics. And that’s all here. I won’t be updating rest enemies yet. Just the drone. bWasSpawnedEarlier bool false Hold the information if this pattern was spawned earlier. CustomDelayBeforeStart float 1.0 Delay for activating Pattern. PlayerDeathCount int 0 We will store how many times player dies on this Pattern. Will be used later. 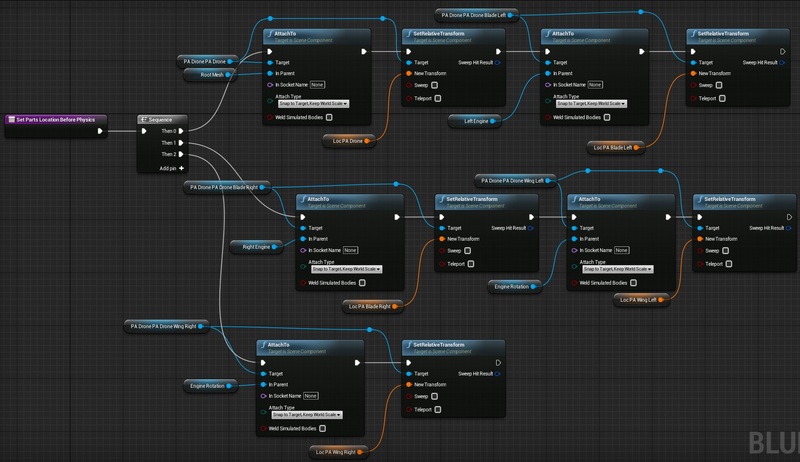 AllEnemies Actor Array Stores all enemies connected to this Pattern. DeadEnemiesCount int 0 How many enemies were killed. Used to determine if all enemies are dead and we can activate next pattern. AllEnemiesLocation Vector Array Stores start location of each enemy as Pattern Manager will move Patterns to and out viewport. In the Components I have added Billboard (Hidden In Game: False) and Arrow to see the Patterns. This will be our balance curve for the Patterns. AllPatterns Pattern Reference Array Stores all Patterns in Level. CurrentPattern Pattern Reference Stores current active Pattern. PatternsLocations Vector Array Stores location of pattern before moving into viewport. PatternStartLocation Vector Location in front of your player. This is location where active pattern should move. CurrentTime float Holds current level time. MaximumLevelTime float 60 Stores maximum level time. After this time level will end. Difficulty Curve Float Reference TestDifficulty Stores Difficulty curve for this Manager. NextBestPatterns Pattern Reference Array Stores chosen patterns for next activation. CurrentTolerance float 0.1 Tolerance value to find best difficulty pattern on curve. ManagerEnabled bool true Is manager enabled? It will return value from 0 to 1. One Local Bool Variable named FoundSomething? This is basically searching for patterns that wasn’t enabled earlier and theirs difficulty is nearly equal than on curve. It will make sure we stop when level time ended. Which will make sure current pattern will move outside the screen and start another pattern after delay. Now create new Blueprint extending from Pattern named P_Drone_00. Now place the Pattern Manager to the level and set your Pattern Start Location – should be location in front of the player. This way your Game State will know when Pattern Manager will finish. And just call it in Begin Play. That’s all! Hope you have learn how to create pattern managers! If you want you can help me out! I will use your donation to buy better assets packs and you will be added to Credits /Backers page as well. Implementing game is taking time but writing about it is taking much more effort! I encountered an issue where all my patterns were starting simultaneously; the drones out of view were getting activated and consequently the patterns were all ending and I was getting the “CAN’T FIND A MATCHING PATTERN MESSAGE” a bunch. Well, I was also getting drones stuck in the walls, so that was indicative of a problem as well. Going into ghost helped to see what was happening. 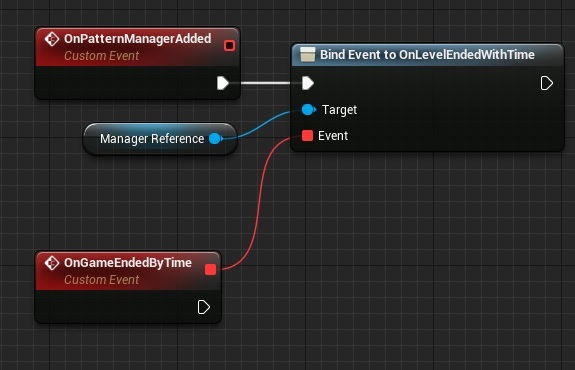 The solution was to go into the Event Tick inside BP_BaseEnemy_FlyingDrone, where all the flying gets done, and add a Branch that checks if “IsActive” is true in between the branch checking “IsDead” and the call to Parent:Tick. I plugged True into Parent Tick and left False blank, and this seems to have solved the issue and given me what was demo’d in the video.